By the time it is finished later this year, the new Salford Royal Hospital will provide 36,000 sq meters of new accommodation and refurbished buildings, vastly improving facilities for patients, visitors and staff. 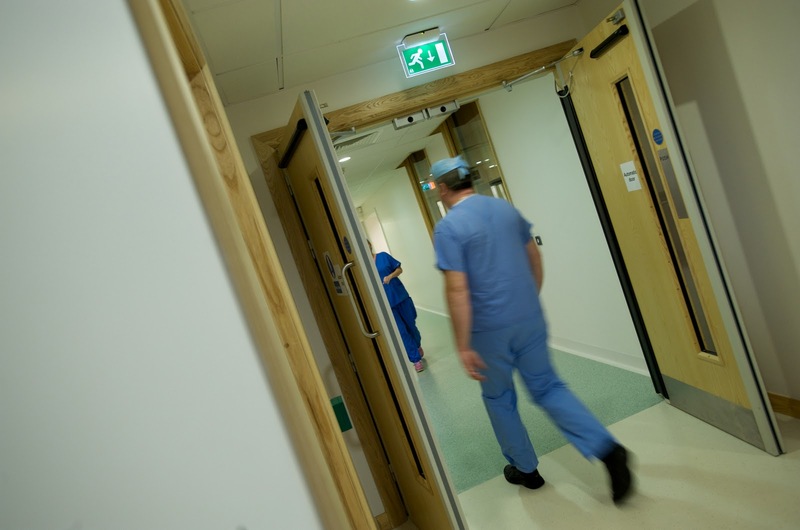 The £200m project will replace outdated, 125-year-old Victorian wards giving a total of 242 hospital beds in buildings fit for 21st century healthcare. The design brief called for the environment to support patient care, for example through attractive open spaces, brighter, roomier areas, improved infection control and sanitary facilities and, wherever possible, providing separate 'routes' for patients currently transferred along crowded, multi-use thoroughfares. Equality Act compliance (previously the Disability Discrimination Act) was also high on the list of priorities. For disabled people to have independent access through single or double swing doors, the opening force, when measured at the leading edge of the door, should be no more than 30 N from 0° (the door in the closed position) to 30° open, and no more than 22.5 N from 30° to 60° of the opening cycle. Balancing all these requirements can be quite a tough act. But, using special door set geometrics, Leaderflush Shapland has developed a complete engineered door set solution which satisfies the Equality Act opening forces requirements whilst still complying with fire and smoke control regulations. The independently tested Leaderflush Shapland solution is a complete door set which is a combination of elements specially designed to work together to meet the legislation - doorleaf, frame, seals, hinges, handle, lock, closer and all other ironmongery and it is subject to special installation and air pressures in the building. When all these elements come together correctly, the solution is effective for almost any type of door set. With many of our largest institutions now insisting that the door set opening force requirements set out in the Equality Act are met, it is vitally important for specifier's to work with manufacturers who can achieve these exacting standards.